A first time mother was well into the third trimester of her pregnancy. She never got sick, currently with no pregnancy-induced illness like hypertension or diabetes. She was regular on her prenatal visits, compliant. Unremarkable. During the wee hours in the morning, she began to feel some abdominal cramps. She thought it was hunger pangs, so she had something eaten. However, after few minutes, in contrast to the relief she was expecting, the abdominal cramps continued, intermittently. She then went to consult her OB-Gyne and have the problem assessed. On internal exam, her cervix was already 1.5 cm dilated. Her abdominal contractions were intermittent. What was unusual was that she was screaming as if in in severe pain, which was incongruent to the degree of the abdominal contraction she was experiencing. She was thus advised admission. Upon arrival at the emergency room, it was noted that the abdomen was a little harder than the usual premature contractions, with her screaming still as if in severe pain. A tracing taken from the abdomen to assess the contractions of the uterus and heart beat of the baby (cardiotocography, CTG) showed abnormal uterine contractions and variable fetal heart rate pattern. Quick thinking by the OB-Gyne lead to the consideration of impending abruptio placenta (premature detachment of placenta from the uterine wall). Normally, the baby gets delivered first, before placenta separates from the uterus. 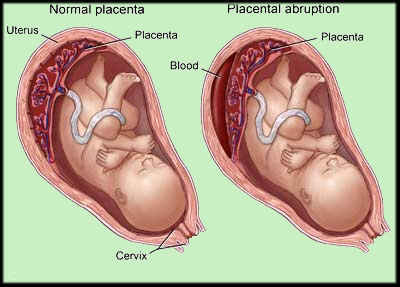 When the placenta prematurely detaches from the uterine wall, ahead of the delivery of the baby, this can lead to exsanguination (massive hemorrhage). On the maternal part, she can have anemia, or worse, hypovolemic shock, due to the blood loss. On the fetal side, since the placenta (which serves as the baby’s siphon for blood from the mother, delivering nutrients and oxygen supply to the baby) prematurely detached, baby can also have hypovolemia, anemia and shock. And since baby gets deprived of oxygen, baby is in a similar situation to that who is drowning or strangulated, resulting to asphyxia, and worse, death. It is then crucial that this condition (abruptio placenta) be diagnosed and managed very early on to prevent the occurrence of such adverse effects on both the mother and the baby. Mother had to undergo emergency cesarean section. While the obstetrician was doing her job, I went to peek on the complete blood count of the mother. It showed that the mother was already having anemia. This means that she was losing significant amount of blood. (This could then explain why the uterus was unusually hard, and her unusual screaming, characteristic of one in severe pain.) On opening up of the uterus, there was a huge blood clot between the uterine wall and placenta, with about 30-40% of the placenta detached from the uterus. When baby came out one minute after opening of the uterus, baby had difficulty of initiating his first breaths. I had to stimulate and provide bag-mask ventilation until baby began to cry. We did uninterrupted skin-to-skin contact for that chance to acquire maternal bacterial flora that will eventually help protect baby from infections. As soon as baby began to grunt (which began at about 10 minutes after skin-to-skin), we took him to the NICU for care. When the result of the complete blood count of the baby came in, it showed that per 100 of white blood cells (WBC), 45 of which were nucleated red blood cells (NRBC). RBCs are produced in the bone marrow. While still undergoing development, the immature forms are still nucleated. Once they mature and before they are released to the peripheral circulation, the nucleus is extruded. This now allows the RBC to be pliable in the peripheral circulation, with an increased carrying capacity for oxygen. If however, in cases where baby becomes deprived of oxygen such as in massive bleeding as was the case for this baby, immature RBCs, the nucleated ones, are then thrown out into the peripheral circulation, in an attempt to increase the oxygen-carrying capacity of the RBCs — to protect the brain, heart and adrenal glands from the devastating effect of hypoxemia and hypoxia. The urgency of the cesarean delivery has just saved the mother from massive hemorrhage and the baby from being asphyxiated. A few minutes of delay perhaps would have resulted otherwise… In the nick of time. IMAGINE this happening to a mother, who is living in a far-flung area, with no access to obstetrics care; where hospital is 2-days travel away; where there are no barangay health workers that can be called, or even if there are, but no nearby health care facilities… would we have saved the mother? the baby? 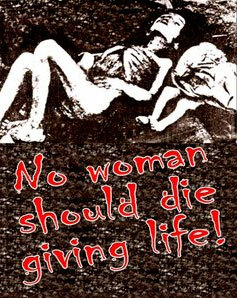 How many perinatal deaths would have to occur before the reproductive law be enacted? Do we need to have a national dumping site of dead mothers and babies (similar to that of the “Killing Fields” of Cambodia), which our leaders will personally inspect, or perhaps do a skull count, before they believe there is a need for the immediate enactment of the reproductive law? Well, one senator wanted to have maternal death certificates as an evidence before he could believe high perinatal mortality is happening.